You know how there's lots of zombie games around at the moment? But they basically all come down to shooting things? 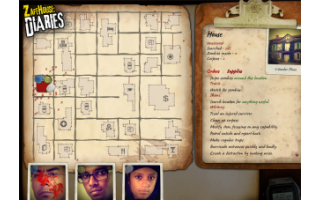 Now Zafehouse Diaries is a proper zombie apocalypse game. 5 survivors. Permadeath. A randomly generated town. Explore for scraps of food, tools, weapons. Barricade yourself to safety. The chance to put your friends/families photos into the game for added emotion. Its got all the ingredients. Superb stuff!